Shepherd Neame Celebration 1698 Ale is a popular Ale available from Tesco Groceries in 50cl to buy online. Visit Tesco Groceries for the best price for 50cl of Shepherd Neame Celebration 1698 Ale or compare prices on our other Ale products. The 1698 Celebration beer is created from Kent Hops and water from the Shepherd Neame artesian well. The Hops are added 3 times to the fermentation process resultling in a great 'thrice hopped' beer. A light copper coloured beer that is reminiscent of caramel and spices with a floral nose. Where to buy Shepherd Neame Celebration 1698 Ale ? Shepherd Neame Celebration 1698 Ale Supermarkets & Stockists. 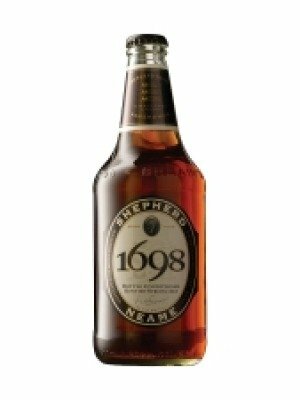 You can buy Shepherd Neame Celebration 1698 Ale online in most retailers and find it in the Ale aisle in supermarkets but we found the best deals online for Shepherd Neame Celebration 1698 Ale in Tesco Groceries, DrinkSupermarket.com, and others. Compare the current price of Shepherd Neame Celebration 1698 Ale in 50cl size in the table of offers below. Simply click on the button to order Shepherd Neame Celebration 1698 Ale online now.